Scrapped in 1950 in Venezuela. 63k Photographed circa 1918, prior to acquisition by the Navy. Northtown a steel-hulled, single-screw tanker—was built in 1901 at South Chicago, III., by the Chicago Shipbuilding Co. for a C. Counselman of Chicago, Ill. From 1902 to 1907, the tanker carried oil on the Great Lakes, out of Fairport and Cleveland, Ohio, initially for Counselman but later for the Texas Co. In 1907, the ship apparently commenced operations out of Port Arthur, Texas. Reboilered at William Cramp and Sons' Shipyards in Philadelphia, Pa., in 1914, Northtown was renamed Alabama sometime soon thereafter. Taken over for operations with the Naval Overseas Transportation Service (NOTS) and assigned the identification number (Id. No.) 2185, Alabama was renamed Amabala—probably to avoid confusion with Alabama (Battleship No. 8) - and commissioned on 21 August 1918 at the Robins Dry Dock, Brooklyn, N.Y., Lt. Comdr. George Nicholas Siefert, USNRF, in command. After a short drydocking at Robins' yard, Amabala shifted to the Tidewater Oil Co., Bayonne, N.J., and there took on a cargo of oil between 25 and 27 August. Anchoring off Tompkinville on the 28th to await the formation of a convoy, she sailed on 30 August for Nova Scotia, reaching the port of Sydney on 4 September. The following day, the tanker weighed anchor and proceeded out in convoy, bound for the British Isles. Amabala reached her destination, Berehaven, Ireland, on 17 September and, over a week later, commenced active fueling operations. Her first customers, on 27 September, included Utah (Battleship No. 31), Nevada (Battleship No. 36), and Oklahoma (Battleship No. 37), followed by the destroyers Stevens (Destroyer No. 86), on 12 October, and Terry (Destroyer No. 25), Conyngham (Destroyer No. 58), and Allen (Destroyer No. 66) on the 14th. Over the next few days, she fueled Oklahoma and Nevada again, and the destroyers Duncan (Destroyer No. 46), Conyngham and Stevens, and Beale (Destroyer No. 40). 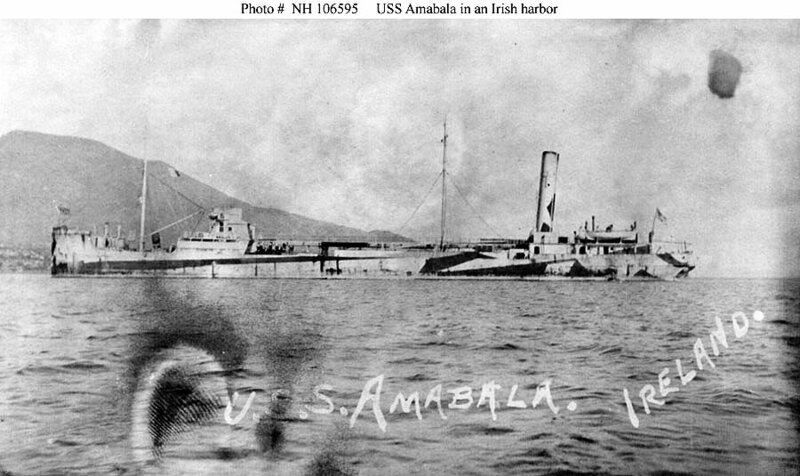 On 5 November, Amabala departed Berehaven at 0720 reaching Queenstown, Ireland, later that afternoon. The following day, she took on a cargo of oil from the British merchant tanker SS Konakry. Underway at 0800 for the return trip to Berehaven on 8 November, Amabala shipped waves over the port bow and port side, the sea carrying away the flukes from her starboard anchor during the passage. She anchored at her "home port" shortly before midnight on the same day. When the armistice was signed on 11 November, the ship was anchored at Berehaven. Four days later, she fueled familiar customers: Utah, Nevada, and Oklahoma. Over the next week, she replenished the depleted fuel bunkers of seven more destroyers and Oklahoma and Utah once again. Amabala departed the British Isles on 1 December and proceeded to Brest to provide logistics support for a sizeable American battleship force expected there. She reached France on the 4th. Two days later she shifted her anchorage onto the "flats" of Brest harbor the ship resting on the bottom at low water, to make room for the expected capital ships. At 0800 on 13 December, Amabala full-dressed ship with the stars and stripes flying proudly from her fore and main. At noon nine American battleships, preceded by a destroyer, stood in through the light mist—an impressive sight. Some 45 minutes later, Pennsylvania (Battleship No. 38), and the majestic transport George Washington (Id. No. 3018), the latter bearing President Woodrow Wilson, stood in, escorted by a covey of destroyers. That evening, Arnabala went alongside Pennsylvania and pumped 1,753 tons of fuel oil into that battleship's depleted bunkers. The next day, the tanker refueled Utah and Oklahoma the destroyers Fairfax (Destroyer No. 93) and Winslow (Destroyer No. 53), and the tug Dreadnaught (SP-1951) on the 15th—the last replenishment of a Navy ship that she would conduct. On the 16th, she weighed anchor and proceeded out to sea, bound for the United States. Arriving off Tompkinsville, Staten Island, on 5 January 1919, Amabala tarried there only briefly before getting underway again, bound for Philadelphia. After pushing her way through fields of thin ice on the Delaware River, Amabala arrived off the Cramps' shipyard on the morning of 11 Januarv. Decommissioned there on the afternoon of 27 February 1919, she was turned over to her prewar owners at Pier 3, North Wharves, Philadelphia, soon thereafter. 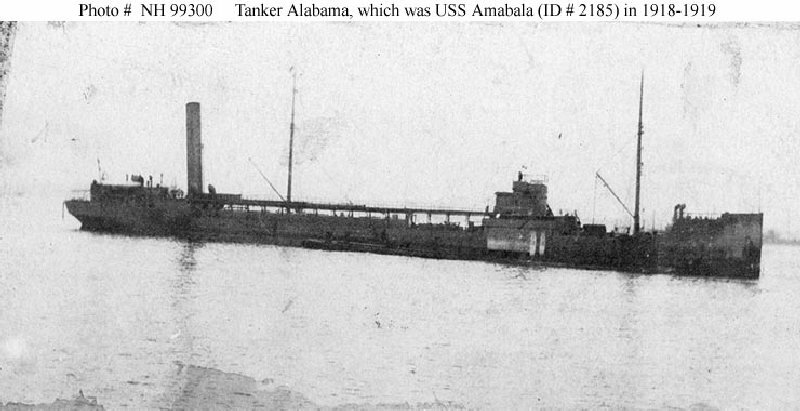 Amabala soon resumed her old name, Alabama, and again began carrying petroleum cargoes for the Texas Co. She continued that service through World War II, operating out of Port Arthur until after the war when she commenced sailing from the port of Wilmington, Del. Although transferred to Venezuelan registry in 1946 or 1947, she retained her name, Alabama, and her affiliation with the Texas Co. (of Venezuela) into the early 1950's, operating from Caracas. She disappeared from shipping registers in 1951, and her ultimate fate is not recorded.